SUNNYVALE, California, September 26, 2018- JFrog, the DevOps technology leader known for enabling liquid software via continuous update flows, is announcing the acquisition of Trainologic, a Dev and DevOps technology consulting company. With decades of combined software consulting and training experience, Trainologic is the natural fit to join JFrog in taking the next leap forward. Together with Trainologic, JFrog will accelerate the adoption of its recently announced platform, helping customers realize the Liquid Software vision. Alongside the acquisition, JFrog is establishing a new elite DevOps consulting unit within the company in order to further accelerate the adoption of DevOps practices and the Enterprise + platform. CEO of Trainologic, Gal Marder, will join JFrog as the head of this unit and VP of DevOps Consulting. 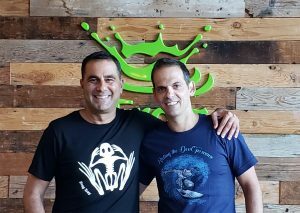 The global team will join JFrog’s local offices. Trainologic was founded in 2009 around Agile Engineering Practices, long before DevOps was accepted as the industry term. Both Trainologic and JFrog observed the same customer pain points in the software release cycle and are now combining forces to continue the journey to become the hub for all universal software updates. JFrog is on a mission to enable Continuous Updates through Liquid Software, empowering developers to code high-quality applications that securely flow to end-users with zero downtime. JFrog is the creator of Artifactory, the heart of the end-to-end Universal platform for automating, managing, securing, distributing, and monitoring all type of binaries. JFrog products are available as open-source, on-premise, and in the cloud on AWS, Microsoft Azure, and Google Cloud. As the leading universal, highly available enterprise DevOps Solution, the JFrog platform empowers customers with trusted and expedited software releases from Code-to-Production. Trusted by more than 4,500 customers, the world’s top brands, such as Amazon, Facebook, Google, Netflix, Uber, VMware, and Spotify depend on JFrog to manage their binaries for their mission-critical applications. JFrog is privately held with offices across North America, Europe, and Asia. Learn more at jfrog.com. Trainologic provides end-to-end development, consulting, and training solutions for today’s top software technologies. Trainologic experts bring decades of experience in DevOps, enterprise application development, big data, web development and front-end technologies and architectural design. Trainologic’s approach, which blends deep technical expertise with strategic engagement has earned it a trusted advisor reputation in the industry. Trainologic advises over 100 companies from startups to recognized brands, including AT&T, BMC Software, Cisco Systems, Dell, HP, and Outbrain.